An outstanding care to restore your hair’s innate beauty. Precious minerals, vitamins, ceramides, amino acids and silk proteins are packed into this rich cream to provide all the nutrients you need to restore vitality to the hair fiber. Your hair is replenished and becomes divinely soft, supple and silky. Silk proteins, amino acids, minerals (gold, silver, magnesium, zinc, silicon), vitamins E and F, pro-vitamin B5, ceramides, fatty acids: all to deliver essential nutrients to the hair fiber. Coconut oil-based ester: to protect and strengthen the hair structure, to make hair supple and soft. 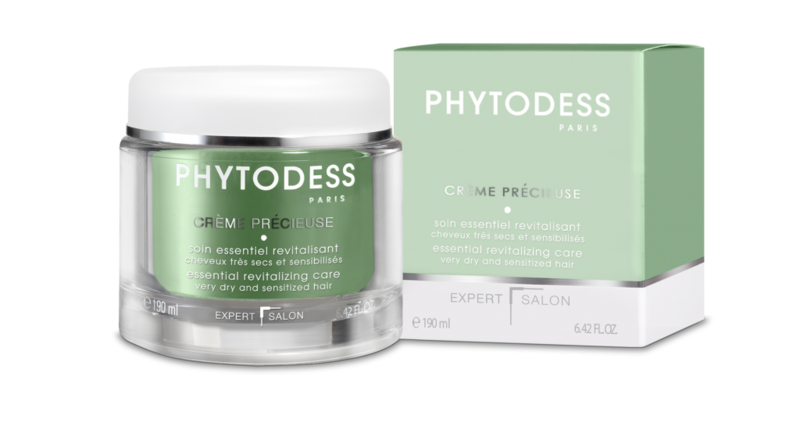 After washing with PHYTODESS shampoo, towel dry hair and apply to lengths, massaging into locks of hair. Let sit for five minutes, then rinse thoroughly. This care can be used every time you wash your hair.